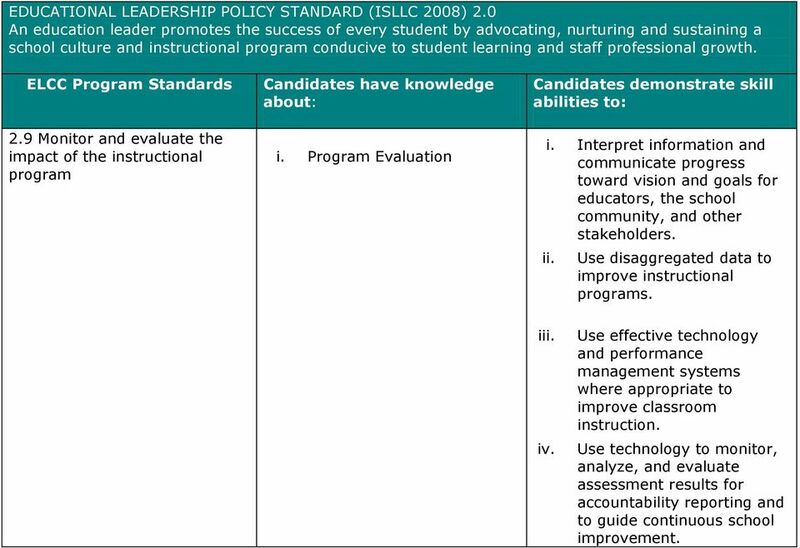 Download "Educational Leadership Program Standards. 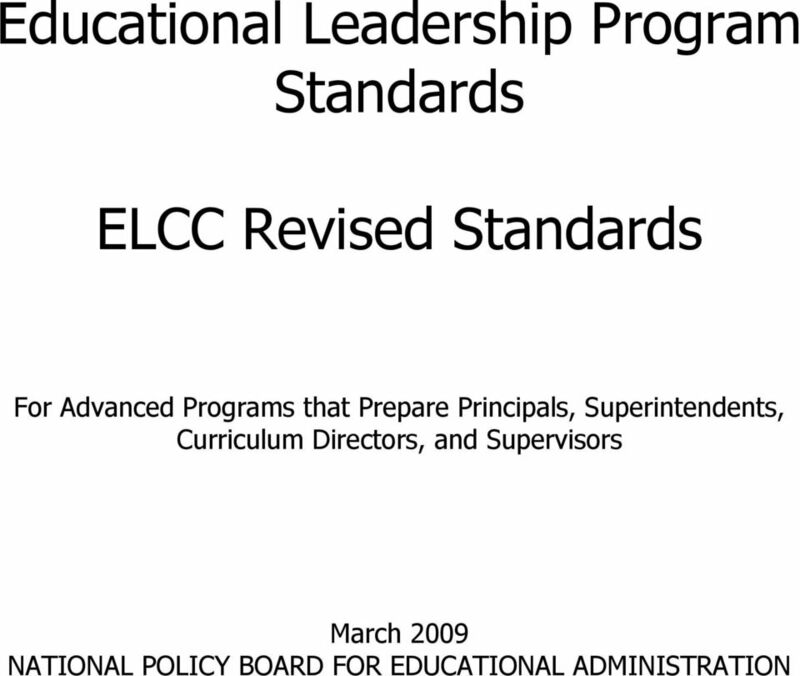 ELCC Revised Standards"
2 EDUCATIONAL LEADERSHIP POLICY STANDARD (ISLLC 2008) 1.0 An education leader promotes the success of every student by facilitating the development, articulation, implementation, and stewardship of a vision of learning that is shared and supported by all stakeholders Collaboratively develop and implement a shared vision and mission i. The nature of collaborative school visioning and the impact of vision and mission on student achievement and various methods for involving stakeholders in the visioning process and consensus building. Theories and relevant knowledge of vision and mission including understanding of learning in a pluralistic society, the diversity of learners and learners needs, schools as interactive social and cultural systems, and social and organizational change. i. Design, articulate, and support a collaborative process for developing and implementing a vision and mission for a school. i. Formulate plans and initiatives to implement the vision and mission statements and communicate the vision and mission to the appropriate constituencies. 3 EDUCATIONAL LEADERSHIP POLICY STANDARD (ISLLC 2008) 1.0 An education leader promotes the success of every student by facilitating the development, articulation, implementation, and stewardship of a vision of learning that is shared and supported by all stakeholders Collect and use data to identify goals, assess organizational effectiveness, and promote organizational learning i. The purposes and processes for collecting, analyzing and using appropriate data to drive decision making that impacts student learning. i The design and utilization of assessment data for learning. Organizational effectiveness and learning. i. Develop and utilize databased research strategies and strategic planning processes that inform the development and support of a vision and mission that promotes learning. Involve stakeholders in collecting and utilizing data to assess the effectiveness of the building and to generate building improvement targets that promote learning. 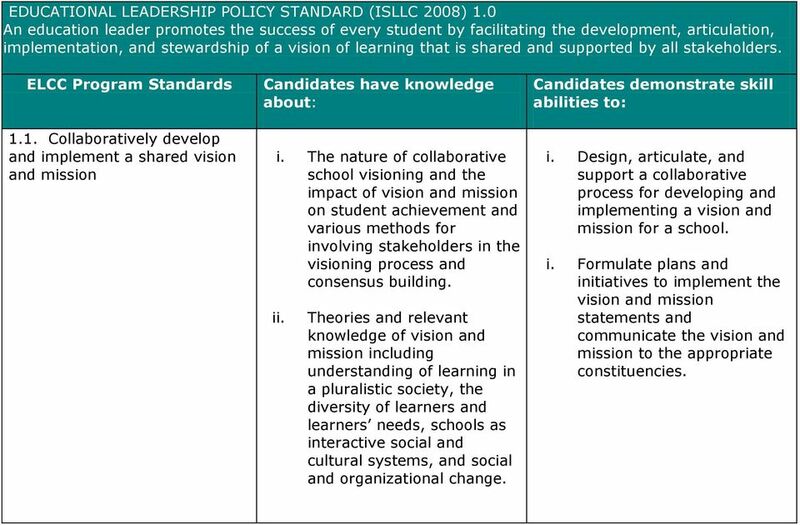 4 EDUCATIONAL LEADERSHIP POLICY STANDARD (ISLLC 2008) 1.0 An education leader promotes the success of every student by facilitating the development, articulation, implementation, and stewardship of a vision of learning that is shared and supported by all stakeholders Create and implement plans to achieve goals i. Strategic, tactical, and operational program planning, implementation, and evaluation. School improvement planning processes. i Variables that affect student achievement. i. Create strategic, tactical and operational goals and collaboratively develop implementation plans to achieve those goals. Develop school improvement plans that align with district improvement plans and reflect these six concepts: vision, instruction, management, collaboration, ethics, and political structure. 5 EDUCATIONAL LEADERSHIP POLICY STANDARD (ISLLC 2008) 1.0 An education leader promotes the success of every student by facilitating the development, articulation, implementation, and stewardship of a vision of learning that is shared and supported by all stakeholders Promote continuous and sustainable improvement i. The role of professional learning in continuous and sustainable improvement. i iv. Continuous and sustained improvement models and processes. Change processes, including continuous and sustainable improvement and discontinuous transformational change at the building-level. Strategic management of human capital and its impact on continuous and sustainable improvement. i. Identify strategies and practices to build organizational capacity to support continuous and sustainable school improvement. i iv. Identify capacity building strategies for developing school leadership capacity. Create a plan to implement change processes to support continuous and sustainable improvement and ensure transformational change at the building-level. Design a comprehensive building-level professional development program. 6 EDUCATIONAL LEADERSHIP POLICY STANDARD (ISLLC 2008) 1.0 An education leader promotes the success of every student by facilitating the development, articulation, implementation, and stewardship of a vision of learning that is shared and supported by all stakeholders Monitor and evaluate progress and revise plans i. Effective strategies for monitoring the implementation and revision of plans to achieve school improvement goals. Program evaluation models. i. Develop plans to monitor program development and implementation to achieve school goals. Construct evaluation processes to assess the effectiveness of school plans and programs. 7 EDUCATIONAL LEADERSHIP POLICY STANDARD (ISLLC 2008) 2.0 An education leader promotes the success of every student by advocating, nurturing and sustaining a school culture and instructional program conducive to student learning and staff professional growth. 2.1 Nurture and sustain a culture of collaboration, trust, learning, and high expectations i. The elements of school culture and ways it can be influenced to ensure student success. i. Work collaboratively with others to accomplish school improvement goals. i iv. Incorporate cultural competence in development of programs, curriculum, and instruction. Monitor school programs and activities to ensure integrated learning opportunities aligned with standards, and consistent with the vision. Recognize, celebrate, and incorporate diversity in programs, curriculum, and instructional practices. 8 EDUCATIONAL LEADERSHIP POLICY STANDARD (ISLLC 2008) 2.0 An education leader promotes the success of every student by advocating, nurturing and sustaining a school culture and instructional program conducive to student learning and staff professional growth. 2.2 Create a comprehensive, rigorous, and coherent curricular program i. The development of quality curriculum including principles/theories of learning, appropriate instructional techniques, monitoring and evaluating instruction, using data and technology to improve instruction, and allocating resources. i. Design comprehensive curriculum development plans. i iv. Analyze instructional lessons. Collaborate with faculty to plan, implement, and evaluate a coordinated and articulated curriculum. Use technology to design, monitor and/or evaluate instructional programs. 9 EDUCATIONAL LEADERSHIP POLICY STANDARD (ISLLC 2008) 2.0 An education leader promotes the success of every student by advocating, nurturing and sustaining a school culture and instructional program conducive to student learning and staff professional growth. 2.3 Create a personalized and motivating learning environment for students i. Human development theories, proven learning and motivational theories and how diversity influences the learning process. i. Facilitate the use of appropriate content-based, customized learning materials and learning strategies in the instruction of students. Create and analyze individualized improvement plans, use data to design learning plans, design and /or implement changes in learning environments. i Develop school-wide comprehensive programs that meet the diverse learning needs and interests of students and school personnel. Promote equity, fairness, and respect among students and faculty. 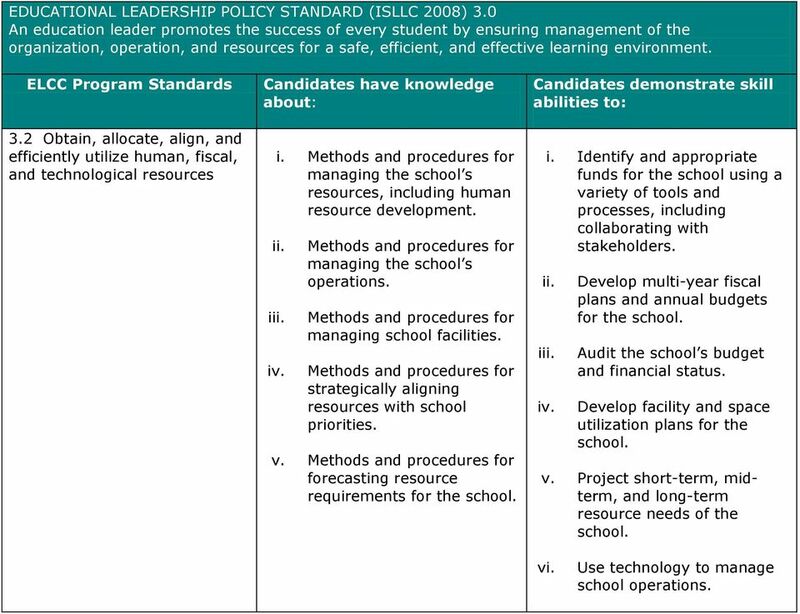 10 EDUCATIONAL LEADERSHIP POLICY STANDARD (ISLLC 2008) 2.0 An education leader promotes the success of every student by advocating, nurturing and sustaining a school culture and instructional program conducive to student learning and staff professional growth. 2.4 Supervise instruction i. Supervision strategies that ensure teachers are demonstrating research based professional practices. Individual professional development plans and continuous progress. i. Provide feedback to improve teaching and learning. i Work collaboratively at the building-level to improve practice for teaching and learning. Monitor individual professional development and continuous improvement. 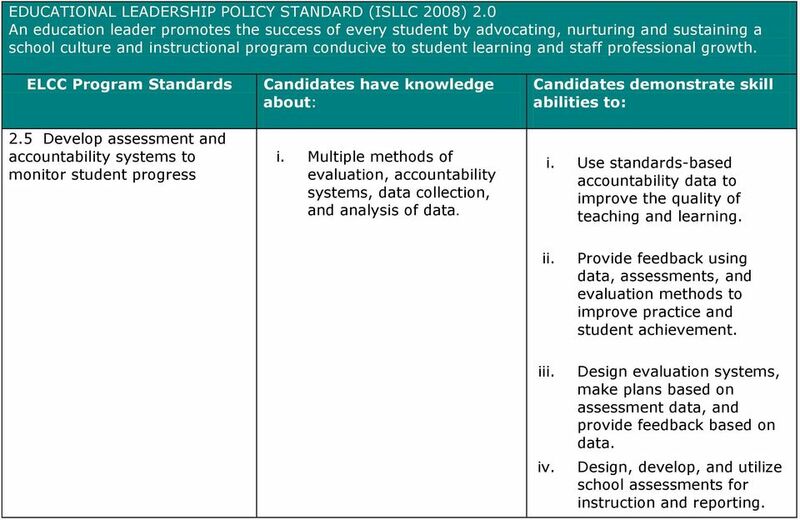 11 EDUCATIONAL LEADERSHIP POLICY STANDARD (ISLLC 2008) 2.0 An education leader promotes the success of every student by advocating, nurturing and sustaining a school culture and instructional program conducive to student learning and staff professional growth. 2.5 Develop assessment and accountability systems to monitor student progress i. Multiple methods of evaluation, accountability systems, data collection, and analysis of data. i. Use standards-based accountability data to improve the quality of teaching and learning. i iv. Provide feedback using data, assessments, and evaluation methods to improve practice and student achievement. Design evaluation systems, make plans based on assessment data, and provide feedback based on data. Design, develop, and utilize school assessments for instruction and reporting. 12 EDUCATIONAL LEADERSHIP POLICY STANDARD (ISLLC 2008) 2.0 An education leader promotes the success of every student by advocating, nurturing and sustaining a school culture and instructional program conducive to student learning and staff professional growth. 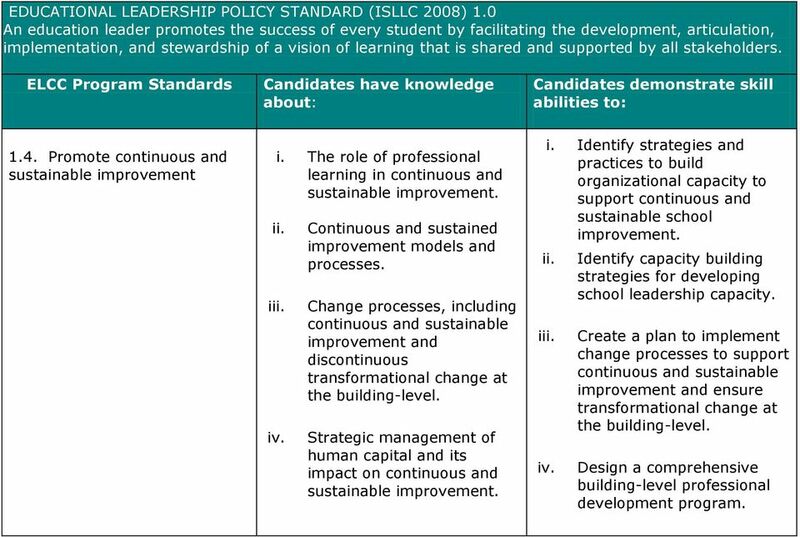 2.6 Develop the instructional and leadership capacity of staff i. Principles of quality professional development. i Effective instructional techniques. Evaluation of professional development. i. Participate in activities that apply principles of effective instruction to improve instructional practices and curricular materials. Design building-level professional growth plans that reflect national professional development standards. i Use a variety of approaches to improve staff performance. 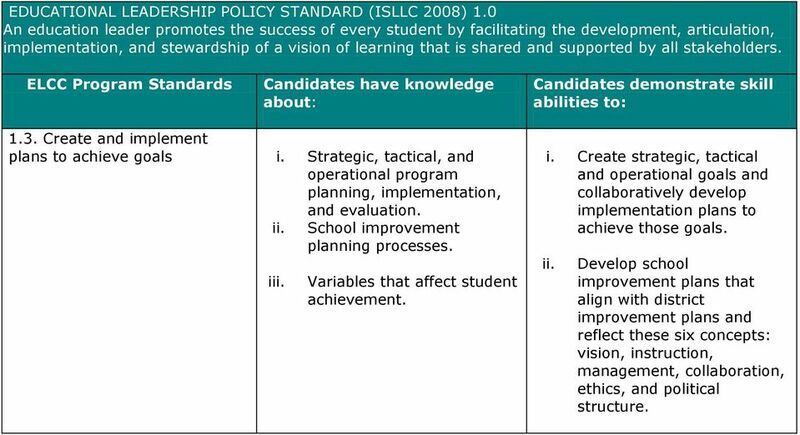 13 EDUCATIONAL LEADERSHIP POLICY STANDARD (ISLLC 2008) 2.0 An education leader promotes the success of every student by advocating, nurturing and sustaining a school culture and instructional program conducive to student learning and staff professional growth. 2.7 Maximize time spent on quality instruction i. School systems that promote efficient practices in the management of people, processes, and resources. i. Provide and monitor the use of differentiated strategies, materials, and technologies to maximize instructional time. 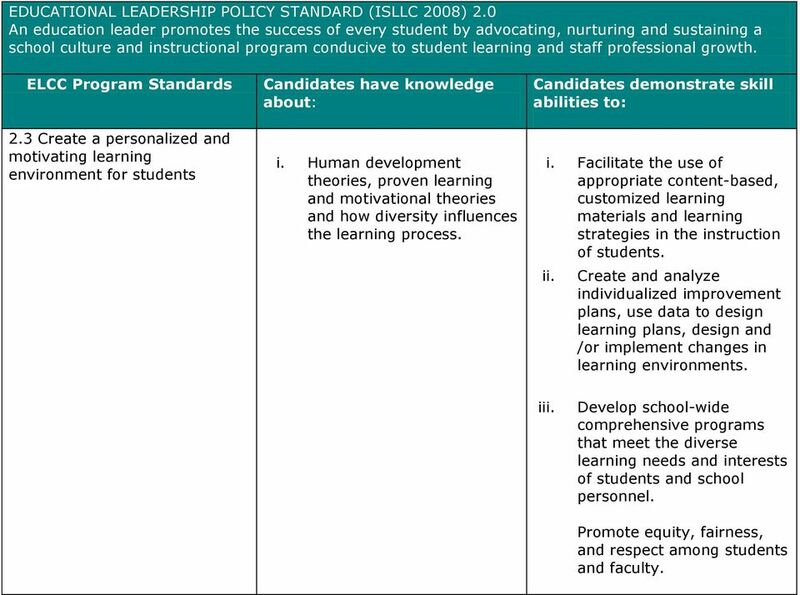 14 EDUCATIONAL LEADERSHIP POLICY STANDARD (ISLLC 2008) 2.0 An education leader promotes the success of every student by advocating, nurturing and sustaining a school culture and instructional program conducive to student learning and staff professional growth. 2.8 Promote the use of the most effective and appropriate technologies to support teaching and learning i. Technology as pedagogical and administrative tools. i. Support initiatives that utilize technologies for improved teaching and student achievement. Use technology for school improvement. 15 EDUCATIONAL LEADERSHIP POLICY STANDARD (ISLLC 2008) 2.0 An education leader promotes the success of every student by advocating, nurturing and sustaining a school culture and instructional program conducive to student learning and staff professional growth. 2.9 Monitor and evaluate the impact of the instructional program i. Program Evaluation i. Interpret information and communicate progress toward vision and goals for educators, the school community, and other stakeholders. Use disaggregated data to improve instructional programs. i iv. Use effective technology and performance management systems where appropriate to improve classroom instruction. Use technology to monitor, analyze, and evaluate assessment results for accountability reporting and to guide continuous school improvement. 16 EDUCATIONAL LEADERSHIP POLICY STANDARD (ISLLC 2008) 3.0 An education leader promotes the success of every student by ensuring management of the organization, operation, and resources for a safe, efficient, and effective learning environment. 3.1 Monitor and evaluate the management and operational systems i. How to assess and manage organizational, operational, and legal resources of the school. i How to manage the marketing and public relations functions of the school. How to strategically align the operations, mission, vision, and goals of the school with the district s strategic framework. i. Analyze the school s processes and operations to identify and prioritize daily and long-term challenges for the school. i Write policies and procedures for the school. Implement and manage long range planning for the school. 17 EDUCATIONAL LEADERSHIP POLICY STANDARD (ISLLC 2008) 3.0 An education leader promotes the success of every student by ensuring management of the organization, operation, and resources for a safe, efficient, and effective learning environment. 3.2 Obtain, allocate, align, and efficiently utilize human, fiscal, and technological resources i. Methods and procedures for managing the school s resources, including human resource development. i iv. Methods and procedures for managing the school s operations. Methods and procedures for managing school facilities. Methods and procedures for strategically aligning resources with school priorities. v. Methods and procedures for forecasting resource requirements for the school. i. Identify and appropriate funds for the school using a variety of tools and processes, including collaborating with stakeholders. i iv. Develop multi-year fiscal plans and annual budgets for the school. Audit the school s budget and financial status. Develop facility and space utilization plans for the school. v. Project short-term, midterm, and long-term resource needs of the school. vi. Use technology to manage school operations. 18 EDUCATIONAL LEADERSHIP POLICY STANDARD (ISLLC 2008) 3.0 An education leader promotes the success of every student by ensuring management of the organization, operation, and resources for a safe, efficient, and effective learning environment. 3.3 Promote and protect the welfare and safety of students and staff. i. Strategies for providing school personnel, students, and visitors with a safe and secure building environment, including how to plan for a substance, weapon, and violence-free school. i. Create policies for a safe and secure building environment. 19 EDUCATIONAL LEADERSHIP POLICY STANDARD (ISLLC 2008) 3.0 An education leader promotes the success of every student by ensuring management of the organization, operation, and resources for a safe, efficient, and effective learning environment. 3.4 Develop the capacity for distributed leadership i. The meaning of distributed leadership and how to create and sustain it. i. Identify leadership capabilities of staff at various levels of the school. i Model collaboration skills. Authentically involve faculty and staff in decisionmaking processes. 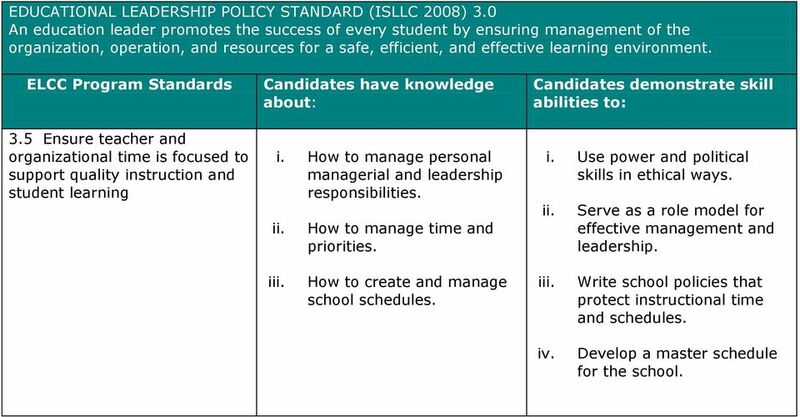 20 EDUCATIONAL LEADERSHIP POLICY STANDARD (ISLLC 2008) 3.0 An education leader promotes the success of every student by ensuring management of the organization, operation, and resources for a safe, efficient, and effective learning environment. 3.5 Ensure teacher and organizational time is focused to support quality instruction and student learning i. How to manage personal managerial and leadership responsibilities. How to manage time and priorities. i. Use power and political skills in ethical ways. Serve as a role model for effective management and leadership. i How to create and manage school schedules. i Write school policies that protect instructional time and schedules. iv. Develop a master schedule for the school. 21 EDUCATIONAL LEADERSHIP POLICY STANDARD (ISLLC 2008) 4.0 An education leader promotes the success of every student by collaborating with faculty and community members, responding to diverse community interests and needs, and mobilizing community resources. 4.1 Collect and analyze data and information pertinent to the educational environment i. The collection and analysis of data and information pertinent to the school educational environment. i. Use the appropriate strategies to collect, analyze and interpret data and information pertinent to the school environment. Communicate information about the school to the community. 22 EDUCATIONAL LEADERSHIP POLICY STANDARD (ISLLC 2008) 4.0 An education leader promotes the success of every student by collaborating with faculty and community members, responding to diverse community interests and needs, and mobilizing community resources. 4.2 Promote understanding, appreciation, and use of the community s diverse cultural, social, and intellectual resources i. Cultural competence. Diverse cultural, social and intellectual community resources. i. Identify and use diverse community resources to improve school programs and meet the needs of all students. 23 EDUCATIONAL LEADERSHIP POLICY STANDARD (ISLLC 2008) 4.0 An education leader promotes the success of every student by collaborating with faculty and community members, responding to diverse community interests and needs, and mobilizing community resources. 4.3 Build and sustain positive relationships with families and caregivers i. The needs of students, parents or caregivers. Organizational culture that promotes open communication with families and caregivers. i. Assess the needs of students, parents or caregivers. Articulate a vision of school leadership characterized by respect for children and their families. i Strategies for effective oral and written communication and collaboration with families and caregivers. i Apply oral and written communication and collaboration strategies to develop school relationships with families and caregivers. iv. Involve families and caregivers in decision making about their children's education. 24 EDUCATIONAL LEADERSHIP POLICY STANDARD (ISLLC 2008) 4.0 An education leader promotes the success of every student by collaborating with faculty and community members, responding to diverse community interests and needs, and mobilizing community resources. 4.4 Build and sustain productive relationships with community partners i. The needs of school community partners. i. Assess the needs of school community partners. School organizational culture that promotes open communication with community partners. Articulate a vision of school leadership characterized by respect for community partners. i School strategies for effective oral and written communication and collaboration to develop and sustain productive relations with community partners. i Apply oral and written communication and collaboration strategies to develop school relationships with community partners. 25 EDUCATIONAL LEADERSHIP POLICY STANDARD (ISLLC 2008) 5.0 An education leader promotes the success of every student by acting with integrity, fairness, and in an ethical manner. 5.1 Ensure a system of accountability for every student s academic and social success i. Federal, state, and local legal/policy guidance to create operational definitions of accountability, equity, and social justice. i. Plan, implement, and evaluate policies, procedures, and practices within the school that support students academic and social successes. 26 EDUCATIONAL LEADERSHIP POLICY STANDARD (ISLLC 2008) 5.0 An education leader promotes the success of every student by acting with integrity, fairness, and in an ethical manner. 5.2 Model principles of selfawareness, reflective practice, transparency, and ethical behavior i. Legal and professional organizations information to understand the basic tenants of ethical behavior, the relationship between ethical behavior, building culture and student achievement. i. Formulate a building-level leadership platform grounded in ethical standards and practices. Analyze decisions in terms of established ethical standards. The effect of ethical behavior on one s own leadership. 27 EDUCATIONAL LEADERSHIP POLICY STANDARD (ISLLC 2008) 5.0 An education leader promotes the success of every student by acting with integrity, fairness, and in an ethical manner. 5.3 Safeguard the values of democracy, equity, and diversity i. Democratic values, equity, and diversity. i. Develop, implement, and evaluate a professional development plan for a school that clearly addresses democratic values, equity, and diversity. 28 EDUCATIONAL LEADERSHIP POLICY STANDARD (ISLLC 2008) 5.0 An education leader promotes the success of every student by acting with integrity, fairness, and in an ethical manner. 5.4 Consider and evaluate the potential moral and legal consequences of decisionmaking i. Current ethical and moral issues facing education, government, and business and their consequences. i. Formulate sound solutions to educational dilemmas across a range of content areas in educational leadership. 29 EDUCATIONAL LEADERSHIP POLICY STANDARD (ISLLC 2008) 5.0 An education leader promotes the success of every student by acting with integrity, fairness, and in an ethical manner. 5.5 Promote social justice and ensure that individual student needs inform all aspects of schooling i. The relationship between social justice, school culture, and student achievement. i. Develop and evaluate school policies, programs, and practices that ensure social justice, equity, confidentiality, acceptance, and respect between and among students and faculty that support student achievement. 30 EDUCATIONAL LEADERSHIP POLICY STANDARD (ISLLC 2008) 6.0 An education leader promotes the success of every student by understanding, responding to, and influencing the political, social, economic, legal, and cultural context. 6.1 Advocate for children, families, and caregivers i. Policies, laws and regulations enacted by state, local and federal authorities that affect schools, especially those targeted to improve educational and social opportunities. i. Analyze the complex causes of poverty and other disadvantages and their effects on families, communities, children and learning. 31 EDUCATIONAL LEADERSHIP POLICY STANDARD (ISLLC 2008) 6.0 An education leader promotes the success of every student by understanding, responding to, and influencing the political, social, economic, legal, and cultural context. 6.2 Act to influence local, district, state, and national decisions affecting student learning i. The larger political, social, economic, legal and cultural context. Knowledge of how to use power and political skills to influence local, state and federal decisions. i. Advocate for school policies and programs that promote equitable learning opportunities and success for all students. Communicate policies, laws, regulations and procedures to appropriate school stakeholders. 32 EDUCATIONAL LEADERSHIP POLICY STANDARD (ISLLC 2008) 6.0 An education leader promotes the success of every student by understanding, responding to, and influencing the political, social, economic, legal, and cultural context. 6.3 Assess, analyze, and anticipate emerging trends and initiatives in order to adapt leadership strategies i. Anticipating future issues and trends that can affect schools. Contemporary and emerging leadership theories. i. Identify emerging trends and issues likely to impact the school. Adapt leadership strategies and practice to address emerging issues. 33 7.1 Field-based Internship Experiences i. Candidates participate in planned and authentic field experiences embedded within courses during the entire duration of the program as assigned by institution faculty and approved by the on-site mentor. i. Field experiences provide opportunities for candidates to work with appropriate community organizations such as social service groups, parent groups, and school boards. i iv. Candidates document all field experiences. Field experiences occur in a variety of school leadership settings that allow candidates to demonstrate a wide range of relevant knowledge and skills. Field experiences provide opportunities for candidates to work with appropriate community organizations such as social service groups and local businesses. 34 7.2 Standards-based Internship Experiences (As demonstrated within ELCC Assessment #4-Internship) i. Internship experiences provide candidates with significant opportunities to synthesize and apply the knowledge and skill abilities identified in the previous ELCC Standards Candidates demonstrate the ability to accept genuine responsibility for leading, facilitating, and making decisions typical of those made by educational leaders within a school. i iv. Intern experiences provide candidates with authentic schoollevel responsibilities that increase over time in amount and complexity and involve direct interaction with staff, students, parents, and school community leaders. Candidates are provided opportunities to apply knowledge and skills articulated by state standards and district policies for educational leaders within a school. 35 7.3 Sustained Experiences i. Candidates are provided a six-month, full-time (9-12 hours per week) internship experience. This experience need not be consecutive and may include experiences of different lengths. However, the internship must include an extended capstone experience to maximize the candidate s opportunities to practice and refine their building-level knowledge and skills. This experience may include two noncontiguous internships of three months each, a four-month internship and two months of field experiences, or another equivalent combination. Candidates submit an internship plan that is approved by both the on-site mentor and institution faculty. 36 7.4 Qualified On-site Mentor i. A qualified on-site mentor is selected collaboratively by the intern candidate and institution faculty. Each on-site mentor has demonstrated successful experience as an educational leader within a school. i High-quality training of on-site mentors is provided by the supervising institution in order that the on-site mentor may provide the intern candidate with ongoing supervision, guidance, and evaluation. 37 7.5 Credit i. Candidates take the internship for credit according to the policies of the program.